Jacob Spies of Douglass and Kristine Cross of Houston have been selected as the 2019 Mr. and Miss SFA. 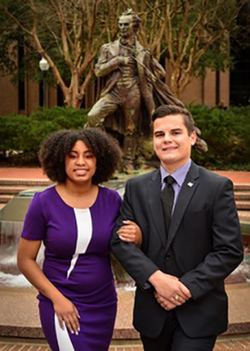 The two Stephen F. Austin State University students will be honored during halftime of the SFA men's basketball game against Sam Houston State University March 9 at 4:30 p.m.
NACOGDOCHES, Texas - Jacob Spies of Douglass and Kristine Cross of Houston have been selected as the 2019 Mr. and Miss SFA. The two Stephen F. Austin State University students will be honored during halftime of the SFA men's basketball game against Sam Houston State University March 9 at 4:30 p.m. The Mr. SFA title was established in honor of the late Stan McKewen, a 1934 SFA graduate. The Miss SFA title was established in honor of Arnodean Covin, who was named Miss SFA in 1940, 1941 and 1942. Spies, who received the Stan McKewen Mr. SFA Award, is a senior accounting major. A 2016 graduate of Douglass High School, he is the son of Mark and Stephanie Spies of Nacogdoches. He currently serves on the executive board for Beta Alpha Psi, an accounting honor society. Previously, he served as president of the Alpha Gamma Rho fraternity at SFA and as vice president for membership development. He has worked as a student assistant for the Department of Residence Life for the past year, as well as a Jack Camp counselor and has been involved with the Order of Omega, a Greek Life honor society. Spies received the SFA Academic Excellence, AGC of Texas and White Electric scholarships. He also received the Temple Inland scholarship for excellence in accounting. Spies is enrolled in the Bachelor of Business Administration and Master of Professional Accountancy five-year program and hopes to one day serve as a chief financial officer. Saville Harris, assistant director of student engagement, who nominated Spies for the award, said, "Jacob has a passion for working with and serving others, often challenging them to be the best they can be. He is a dedicated leader and as a result, I have yet to see him get discouraged or give up, even when the result is not what he anticipated." Cross, who received the Arnodean Covin Miss SFA Award, is a senior majoring in food, nutrition and dietetics. A 2015 graduate of Elkins High School, she is the daughter of Leslie W. Cross Jr. of Houston. Cross has been involved on campus since her arrival, initially enrolling in the Freshman Leadership Academy and later serving as a student instructor for the program, which is a specialized section of the university's SFA 101 freshman success seminar. She currently serves as vice president of the Student United Way, where she is responsible for fundraising and recruiting other students to volunteer for events supporting the Nacogdoches United Way. She also is an Orientation student coordinator, and she previously served two summers as an Orientation leader, where she helped students transition from high school to college life. She also was a counselor for SFA's extended orientation program, Jack Camp. Cross received the President's Volunteer Service Award in 2017 for volunteering more than 250 hours during an eight-month period. She plans to attend graduate school and study student affairs and higher education. Veronica Beavers, director of multicultural affairs at SFA, who nominated Cross, said, "Kristine's impact has been remarkable. Throughout her time at SFA, she has grown in her passion for working in the areas of social justice, diversity and multiculturalism. She has developed a strong appreciation for all aspects of diversity at SFA." The Mr. and Miss SFA titles are annually presented by the SFA Office of Student Affairs Programs and the alumni association to exemplary students who well represent and promote the univeristy. Recipients are selected based on their scholarship, participation and leadership in academic and co-curricular activities, and service and loyalty to the university. Selections are made by a committee of faculty, staff, community leaders and alumni. Please contact (936) 468-7249 or visit www.sfasu.edu/studentaffairs and http://www.sfaalumni.com/ for more information.